The Ho-Chunk, Winnebago, Kiowa, Iowa, and Otoe-Missouria people gathered at the 7 Clans First Council Hotel and Casino in Newkirk, Oklahoma for the 2019 Otoe-Missouria Winter Encampment. Approximately 500 people were in attendance on Saturday, Jan. 26. According to Emcee John Arkeketa, this was the second time Ho-Chunk Nation was formally invited to Otoe-Missouria Country. “This is the first time I’ve ever seen Iowas, Winnebagos, Ho-Chunks, and Otoe-Missourias all sitting together,” Arkeketa said. The Winter Encampment signifies a time of ceremony and celebration. “This is the time of year where we come together and feed our tribe,” he said. 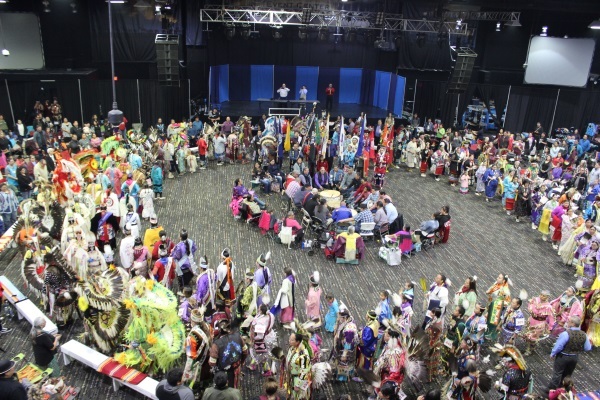 During the Winter Encampment, friends and relatives get a chance to visit and reconnect through laughter, dance, and ceremony. “I’m glad that our tribes came together again and that we have the opportunity,” Emcee John said. Friday evening, Jan. 25, members of the Ho-Chunk Nation were presented a feast and a ceremonial Tail Dance. The following morning, the Moccasin Game was played between Ho-Chunk and Otoe-Missouria tribal members. The Winter Encampment itinerary started Saturday, Jan. 26, at 1 pm with Gourd Dancing, a dinner break at 5 pm, and concluded with Grand Entry at 7 pm. Head Singer was Mike Kihega, Head Man Dancer was Lawrence Walker, Jr., Head Lady Dancer was Leda Green, Head Gourd was Chairman John Shotton, Co-Hosts were Red Rock Creek, Emcees included Frank Carson and John Arkeketa, special guests were the Kiowa Gourd Clan, Arena Directors included Mike Hudson and Eric Payne, and Water Boys were Derek Bible and Hagen Childs. Ho-Chunk members were brought out into the arena to be honored during the Gourd Dances. Gifts and prayers were exchanged between families of the tribes. The Kiowa Gourd Clan was in attendance, and an elder from the Kiowa Gourd Clan described the Gourd Dance at the speaker stand. He said, “When this relationship started, the Otoe people they asked ‘Well, we want to gourd dance also. What do we do? To become a part of this, how do we carry this out? “We told them ‘You know it’s a very enjoyable dance, the music is beautiful, the songs are beautiful. We can’t stop anybody from dancing, but all we ask is that you respect it and respect us. We are proud of our Gourd Clan. “We don’t have rules or anything like that. We have protocol. There is a protocol that we have at the arena, from the time that we become interested in this and start taking part. I look out here in the circle, and I see that our Otoe people are respecting the protocol that we have. Long sleeve shirts and wear the best you can, because you are in front of people and everyone is looking at you, and you want to put your best foot forward. The Kiowa Gourd Clan then presented gifts to the drum and Head Singer Mike Kahiga. The 7 Clans First Council Hotel and Casino provided dinner. Joyce Big Soldier-Miller, an elder from the Iowa Tribe of Oklahoma, was asked to judge the contests and she shared her sentiments of the Winter Encampment. “The Winter Encampment brings a lot of people together. You get to see all of your relatives and friends. It’s exciting to watch the dancers. The outfits are newer; they are more elaborate and more loud,” Bid Soldier-Miller said. “It makes me feel very proud to be indigenous, to see all of the indigenous people come together. Most of them are dressed to their finest and wearing their regalia. It gives me a proud feeling to be shoulder to shoulder with this many indigenous people,” Joyce said. Ho-Chunk Nation Traditional Chief Clayton Winneshiek enjoyed the Winter Encampment and welcomed the friendliness the Otoe-Missouria people greeted him with. Ho-Chunk Nation President Wilfred Cleveland reflects with admiration of the Otoe-Missouria Tribe and of the Winter Encampment. “Spiritually, it was very uplifting,” he said. “Everything that they did, when we first got there Friday night. They had a meal there and set a place for us to sit and eat. All of those gestures that were made, the hospitality, they made sure we had a place to stay and that we always had food to eat. “They even acknowledged us within the Gourd Dance itself. They took us out there on the floor and let us participate in the honoring they did within that ceremony. Relationships between the Ho-Chunk and Otoe-Missouria people have been made, and President Cleveland wishes for relations between the people to get stronger over time. “Even with our children and the future generations, there will be a better-continued relationship that gets stronger,” President Cleveland said.